Galini is a luxury 3 bedroom villa situated within the picturesque village of Pissouri, and only a 2 minute walk from the traditional pedestrianised village square, where you will find many tavernas, restaurants, shops and banks. As well as a private pool, the villa has ample outdoor space for entertaining including shaded areas and gas BBQ. Galini is open plan and spacious comprising of a large fully equipped kitchen, tastefully decorated lounge with ceiling fan, satellite TV with most UK free view channels and DVD. The dining area has patio doors with access to the garden/pool. There is also a cloakroom/visitors toilet on the ground floor. Upstairs there is a large family bathroom, 3 bedrooms - 2 double and a twin. The master bedroom has en-suite shower/wc and balcony with sea views. All bedrooms have air-conditioning, ceiling fans, and wardrobes. Mr Durup is a retired ex British Forces (Royal Engineers) who has lived in Cyprus for the last 22 years with his Cypriot Wife. This lovely and homely property offers you a high quality of comfort. It is ideally situated to walk to the village square where all the daily and evening activities are in full swing. The swimming pool is warm and children friendly. Pissouri is ideally situated half way between the two large Towns of Limassol and Paphos. For Town activities you can choose left or right. We are blessed with two championship golf courses within 15 minutes drive from the villa. The Blue flag beach of Pissouri 10 minutes drive away provides all the usual water sports activities. En-suite bathroom to bedroom 1 with shower and wc. Family bathroom with bath, shower and wc. Cloakroom with wc. Notes on accommodation: Cots and high-chairs are available on request, please request at the time of booking. Outside: Galini has a private pool with ample seating and shaded areas for entertaining. There are also 4 sunbeds and a gas barbecue. Cleaning / Towels / Linen / Maid service: All linen and towels are provided except for beach/swimming pool towels. Galini is a 5 minute drive from Pissouri beach. The beach is safe, clean and picturesque, earning blue flag status and offers a wide variety of water sports including jet skiing and paragliding etc. Paphos and Limassol. This makes it an ideal location for sightseeing and exploring, places of interest within 30 minutes drive include Petra tou Romiou, the legendary birthplace of Aphrodite, a beautiful stretch of coastline with a spectacular rocky outcrop. Curium Beach and amphitheatre, Troodos Mountains and Fasouri Water Park etc. Pissouri is made up of 2 distinct communities - Pissouri Village and Pissouri Jetty. 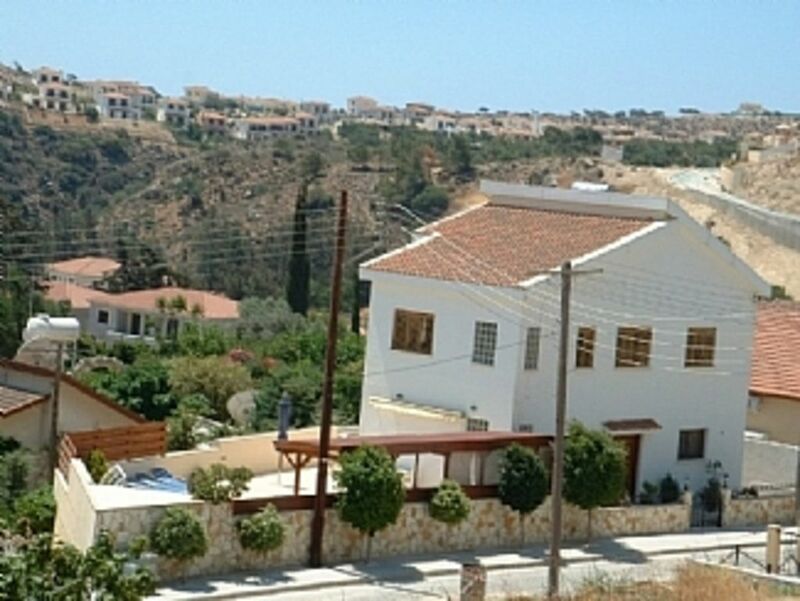 Pissouri village has retained a real Cypriot charm whilst offering everything that you might need including a range of shops, chemist, banks and tavernas. At night, there is a relaxed and calm atmosphere, away from crowds and nightclubs. Eating out is relatively inexpensive and the local wines are delicious. In the summer months there are weekly 'Cyprus nights' held in the lovely traffic free village square, with traditional Cyprus dancing and music. Pissouri Jetty offers a selection of Cypriot tavernas, a couple of small supermarkets, a bank and 1 luxury 5 star hotel. Pissouri offers a variety of holiday options. It is an ideal place to relax and unwind enjoying the pleasures of the beach and surrounding countryside. Booking Notes: 50% deposit required on booking and balance 6 weeks prior to arrival. Changeover Day: Changeover day is flexible. On arrival not before 2pm and departure by 12 noon. Notes on prices: Prices are for the property per week in UK Pounds.